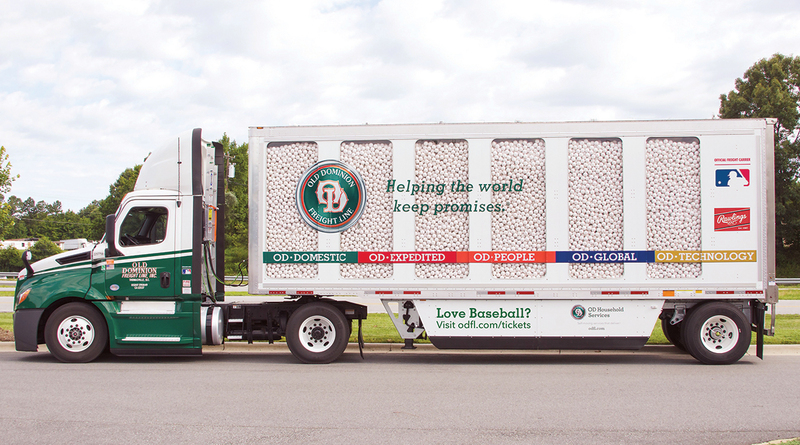 When Old Dominion Freight Line Inc. landed an advertising and marketing contract with Major League Baseball earlier this year, it was part of a long-term strategy to grow its business, representatives of the Thomasville, N.C.,-based trucking and logistics company said. The MLB logo eventually will adorn Old Dominion’s entire fleet of 32,000 tractor-trailers, marking it as the official freight carrier for the league. The company started looking at sports marketing opportunities several years ago as a way to elevate its brand, Carter said. They knew a lot of their target audience had high interest in football, but the expense would be considerable for a relatively short season. “Baseball’s right behind it, in terms of interest, and baseball’s a good long season,” he said. The full deal brought the company advertising opportunities on TV and online, as well as exposure at the All-Star Game and World Series. Old Dominion uses the MLB logo on its trucks and in its advertisements. The company has about 19,000 total employees, including around 1,800 in the Triad region of North Carolina. It’s grown rapidly throughout the country, opening service centers that manage its freight network. Old Dominion customized a trailer with a see-through design that it filled with baseballs and took to ballparks throughout the summer. The “billboard on wheels,” as Carter called it, was used in a promotion where it gave away World Series tickets to the fan who made the most accurate guess as to how many baseballs could fit inside. More than 51,000 people ventured a guess and Nicholas Haas of Roanoke, Texas, won with a guess of 178,596 baseballs.